Would you like to do something special for families in need this Christmas? You can partner with us to provide toys for children in Kent County. 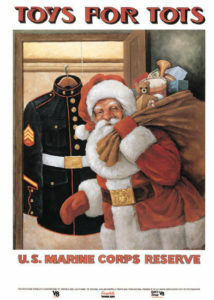 The Post is participating in the Toys for Tots program again this holiday season, as a drop off site for toys. Toys for Tots is a volunteer organization whose goal is to collect new, unwrapped toys for kids 0-16, and distribute them to children who would not otherwise receive a gift during the holiday season. Toys for teens are always especially needed. The program runs now through December 17. Just bring a new, unwrapped toy to our office at 36 E. Maple Street in Cedar Springs, Monday through Thursday, 10 a.m. to 5 p.m., and Fridays 10 a.m. to 2 p.m. If you can’t make that time, call us to make other arrangements.